With their most recent sample library Largo, Dutch sample library developer Sonokinetic just released a long-awaited addition to their popular line of phrase-based libraries. Largo (meaning “slow” in Latin) delves into the realm of soaring string melodies, lush woodwind chord ensembles and smooth brass lines – sounds reminiscent of classic film scores and historical features. Making use of the same comprehensive, phrase-based performance engine as its predecessors Maximo, Sotto, Capriccio and Grosso, the new Largo seeks to provide you with an easy-to-use composing tool that puts luxurious, majestic orchestral performances right at your fingertips. We’ve got our hands on a copy of Largo and in this review, we’ll find out together what Largo is capable of and how it can facilitate a modern media composer’s life. As its predecessor libraries, Largo comes with 4 distinct microphone positions (Close, Decca Tree, Wide, Far) which can be blended freely. Since Largo was recorded at the same concert hall as Sonokinetic’s other phrase-based libraries, you can easily mix and match both phrases and products. Though Largo’s comprehensive set of phrases was recorded at a slow tempo of 75 BPM, you can play back the samples at any tempo you like as they are perfectly tempo-synced to your host DAW. The 44,000 samples recorded for Largo are available in two different bit rates. The full version of Largo comes in a 69GB large, 24 Bit version. Along with it, you also get a bit-reduced, 16 Bit version of the library which is roughly half the size (37GB). Largo grants access to both versions so you can decided for yourself which one suits your system specs the best. Each version also comes with dedicated “Lite” patches that feature a pre-mixed stereo mic position only to further reduce CPU footprint. In contrast to other “regular” orchestral libraries, Largo is not a product that gives access to multi-sampled articulations of symphonic instruments, but rather provides you with pre-orchestrated performances or phrases of orchestral sections. 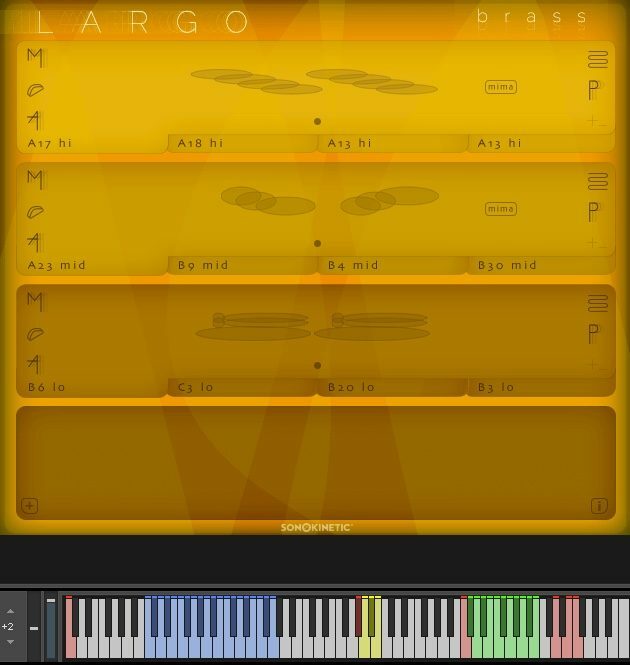 Largo’s complex engine allows you to freely choose and blend different phrases as well as to play them back at any key and tempo. 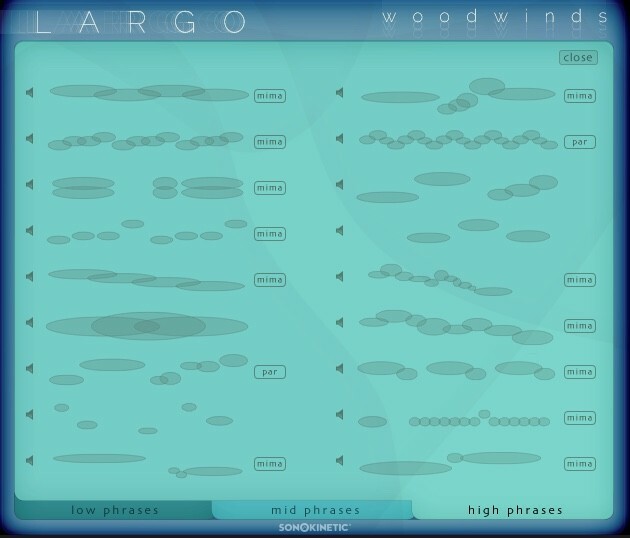 Largo is divided into three main patches or sections: Strings, Woodwinds & Brass. Using phrase slots, each of these sections can hold up to three different phrases which can be played back simultaneously. In order to fill these slots, you can choose from again three different phrase menus labeled High, Mid and Low, each holding around 18 phrases. This allows you to essentially create unique 3-layer multis that interlock and play back orchestral performances in perfect sync. While a patch is initially loaded with one phrase from each register, you could also run three loops of the same register in one patch if you want to. While this may sound a bit complicated, it really isn’t once you get accustomed to the interface. If you’re owner of one of Sonokinetic’s earlier phrase-based libraries you shouldn’t have any problem at all and feel at home right away. To let Largo’s majestic sounds ring, all you have to do is press three-note chords on the lower half of your keyboard (C1-G2). 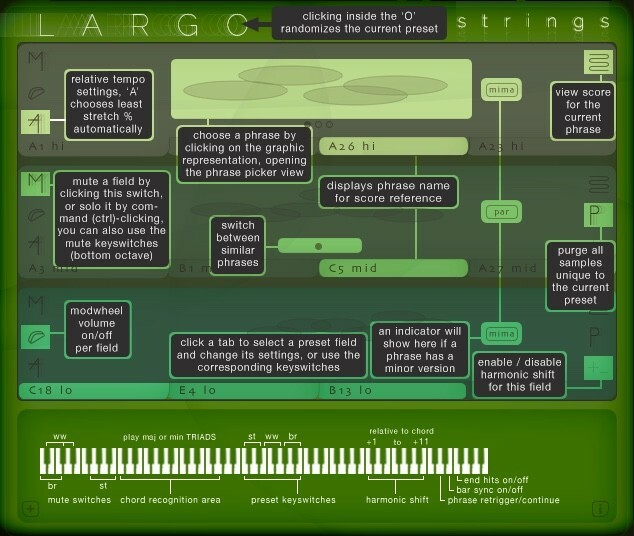 Largo’s engine will analyze the keys and automatically assigns all the phrases and registers accordingly. This is a great way to come up with great sounding and readily available cue starters or harmonic beds. The first one is a function called Voice-Leading. As long as one note of a chord you triggered is held, the engine will keep playing the full chord. This frees up some fingers to transition into a new chord more easily and with no gap between the phrases. By means of the F6 keyswitch on your MIDI keyboard, you also have full control over the release samples that were recorded with the original samples. These release samples add a defined end to your phrases and include a natural reverb tail. While you might not necessarily need to turn on release samples when transitioning from chord to chord, they’re definitely very useful for providing a realistic end to your phrases. Especially if you want to stop a phrase in the middle of playing, you might want to turn on release samples. With the keyswitch D6, you’re able to enable the Phrase Continue / Retrigger function. Usually, when changing a chord, the phrases you trigger would cycle through back from their start point, even when you switch chords in the middle of a bar. With the Phrase Continue function activated, the phrase will continue playing from the position it was at when you changed the chord instead of retriggering from the beginning. The last important feature is the Bar Sync option (keyswitch: E6). This works in conjunction with the Phrase Continue feature. When activated, the engine of Largo reads the position of the bar in your sequencer and will retain the playback of phrases according to that bar. This means that if you trigger a phrase on the second beat of a bar, the sample will play from its second bar, too. All of those playback features are activated by default, but you can turn them off and back on by pressing the according keyswitches. High velocities will engage the features, low velocities will turn them off. Of course, Largo’s GUI holds quite a few more interesting options for phrasing, harmonic shifting, tuning, tempo and sequencing so make sure to take a look at the product’s well-written manual. To sequence Largo’s phrases, you’d either play the chords you like or draw them in manually in the piano roll of your DAW. To achieve smooth transitions, you can use the voice-leading method described above or press the sustain pedal to ensure that the loops keep playing through. An often overlooked feature of Sonokinetic’s phrase-based library is the Score View, accessible by the curved lines symbol on the main interface. Score View is a great feature in that it shows you which notes and articulations are actually being played by which instrument of the orchestra. 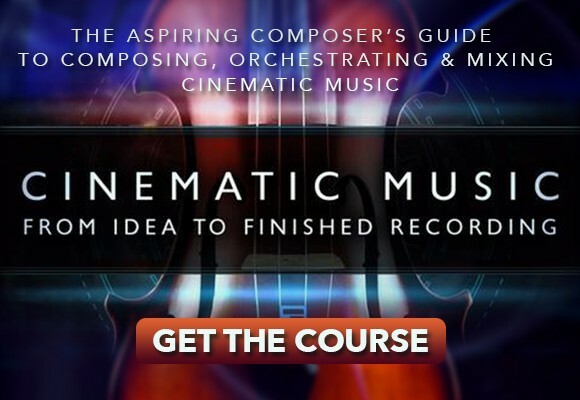 Not only do these virtual score sheets give you a better understanding of what certain phrases are made up of, but they also serve as a tremendous resource for learning orchestration. What’s more, you’re even able to convert your score sheet into actual MIDI data which can then can be played by other sample instruments or synths. 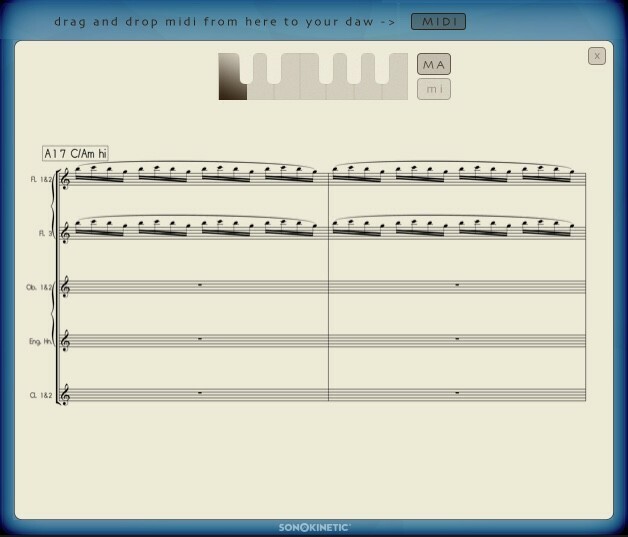 Simply click on the “MIDI” label and drag the file into a track of your sequencer. 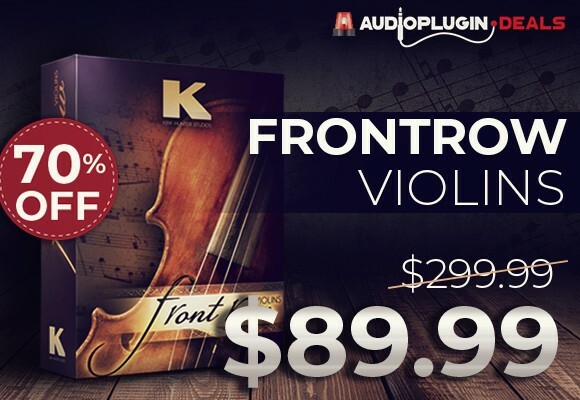 Even after playing just a few chords and phrases, it becomes apparent that Sonokinetic kept their promise of providing composers with elegant, majestic and beautiful orchestral soundscapes. The lush, expressive sound of the strings and woodwinds is amazing and really brings home how different a live orchestra playing together can sound from individual patches. These tasty arcs and swells within the player’s performances are very hard to obtain with plain samples and are definitely one thing that shines in Largo. The stately brass phrases sound beautifully warm, round and noble and make for a great accompany two the other sections. Since the library is focused on heavy thematic writing, you get all those beautiful, accented transitions and glissandi between notes. 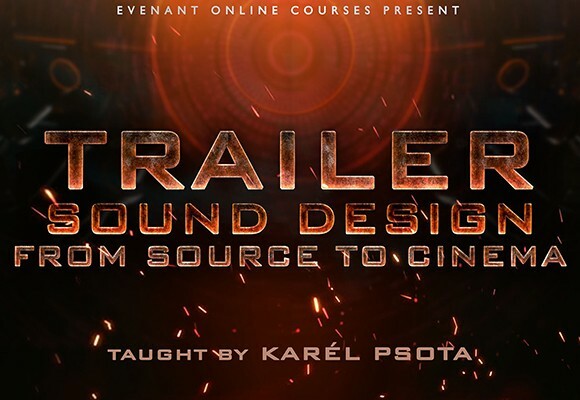 This allows for arrangements reminiscent of classic scores by Hollywood greats like John Williams or Jerry Goldsmith. Overall, Largo’s phrases really benefit from being recorded as sections as you can literally hear and feel the different musicians interacting with each other. Without much effort, you get an authentic orchestral balance by just combining different sections. The lush recording hall Largo was captured in helps to glue everything together nicely and provides the instrument sections with an expansive sheen. With Largo, Sonokinetic shows again how working with phrase-based samples can be easy and fun. 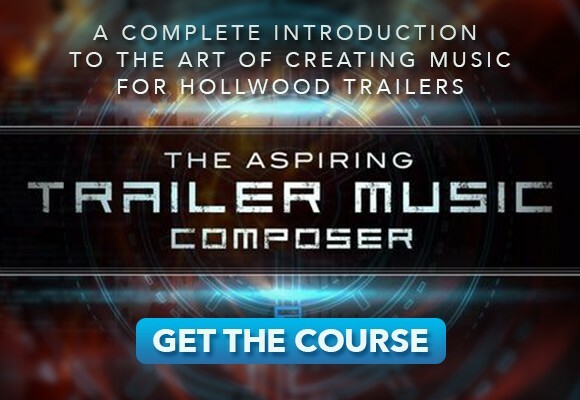 Enhancing your arrangements and adding new facets to your orchestral compositions is now easier than ever. Having tons of pre-orchestrated, tempo-synced phrases at your fingertips in conjunction with a no-nonsense interface can help any modern media composer come up with convincing sounds quickly. Combining and layering the different instrument sections really gives you an astonishingly lush, balanced and vivid orchestral sound. The concern, that working with pre-recorded phrases is cumbersome and can quickly be uncovered as fake is sorted out by Largo to a large degree as it is really easy to come up with great and realistic sounding results with no effort. Especially if you layer Largo’s expressive harmonic beds with some multi-samples from other libraries you can come up with a full and authentic orchestral sound that might fool even the most experienced orchestra listener. Largo is available on Sonokinetic’s online store for $302.00.